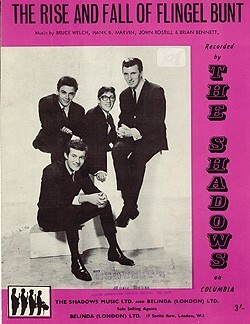 The Shadows were starting to run out of truly classic high-charting singles by 1964, but this one with the off-the-wall title has stayed the course magnificently, attracting a host of wannabes (and eccentricities) over the years, including an overdriven makeover from the Ben/Hank Marvin partnership. 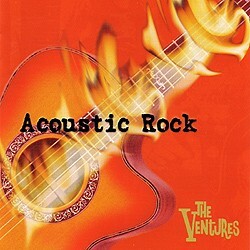 The Ventures’ rendition on their Acoustic Rock album (see on ) is emphatically not one of your cheap American imitations. It may lack the uncluttered air of what The Shadows termed a “studio jam” – the intricacies and contrivances of modern recording techniques with special reference to the work lavished by The Ventures upon this particular number are highlighted by Dave Towers in New Gandy Dancer 39  27 & Pipeline 48  22-23; id. 51  7. Yet for all that it thuds along in style and sounds (as it should) like a real riot, with Nokie Edwards and Jeff Baxter on lead guitars and added slide guitar from the latter, coming in beautifully and with a vengeance just after the two-minute mark. Great rhythm (two contributors), great bass, great percussion, great everything.